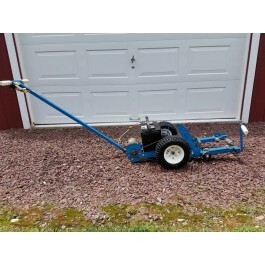 Nose Dragger Dragger aircraft tug for sale. This is the electric model that runs off of a 12 volt battery. Good working condition. This tug was used on a Piper Seneca and a Piper Arrow. We first sold this tug in early 2018 after we sold a client's Piper Seneca. We sold it to a gentleman that owned a Piper Arrow. The Piper Arrow owner gave up his hangar and no longer needs the tug. $1,100.00 USD. Feel free to make a reasonable offer. We will deliver to the following airports for free: KGAI, KFDK. Nose Dragger Dragger - 12 volt battery operated tug with charger. Good working condition.